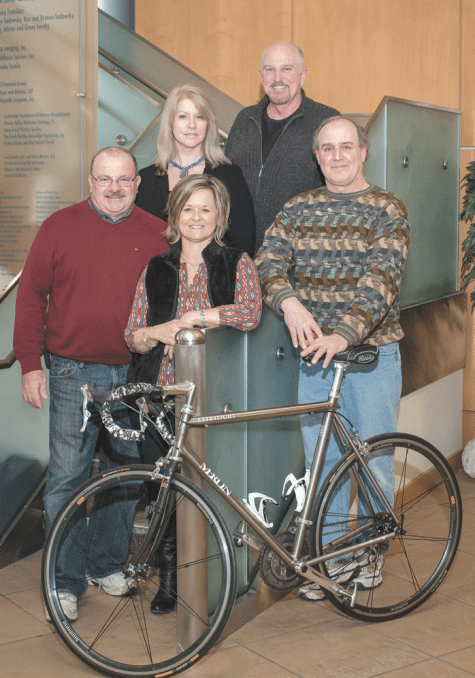 Domenic and Michelle Battista (front row, left), with K-Ride founders (from left) Kim Zachery, Dan Williams, and Steve Stark. Dr. Satkiran Grewal says that, when parents first hear the word ‘cancer’ used in the same sentence as their child’s name, they often don’t really hear much, if anything, said immediately after that. They’re listening, said Grewal, chief of Pediatric Oncology at Baystate Children’s Hospital, but often what is said doesn’t fully register because there is a surreal quality to the news they’ve been given, and they’re still attempting to digest it while trying to anticipate what happens next. Later, parents and other family members will inevitably need help understanding, coordinating, and simply coping with the many aspects of a prolonged cancer battle. And these are some of the many reasons why, in 2012, Baystate created a new position, an individual (a nurse practitioner, or NP) who acts essentially as a liaison between the families of children and adolescents diagnosed with cancer and the specialists providing them care. It’s a position funded in part by money raised by participants in Katelynn’s Ride, or K-Ride, as it’s called, an annual event created to honor the spirit and courage of Katelynn Battista, who lost a decade-long battle with leukemia in 1997 at age 11. But support for this position is just one of many reasons why K-Ride is being honored as a Difference Maker for 2015. Indeed, while the money it raises for both Baystate Children’s Hospital and the Dana Farber Cancer Institute through the Jimmy Fund, and also for individual families in the form of $1,000 grants to help them cope with the many expenses associated with a cancer diagnosis, is substantial ($1.7 million to date), it is only part of the story. The event itself, through the camaraderie it creates and the critical help it provides to those coping with this deadly disease, makes a difference in the lives of those who participate and, while doing so, brings different, often-inspiring storylines to the ride’s starting line on the grounds of Hampshire College. People like Deb Rossmeil, who started riding to honor the successful fight against leukemia waged by her son, Adam, and to help others facing similar battles. In the beginning, she would ride with a few family members, but today, the team now known as Adam’s Animals brings as many as 30 people to the ride and is annually one of the top fund-raisers. 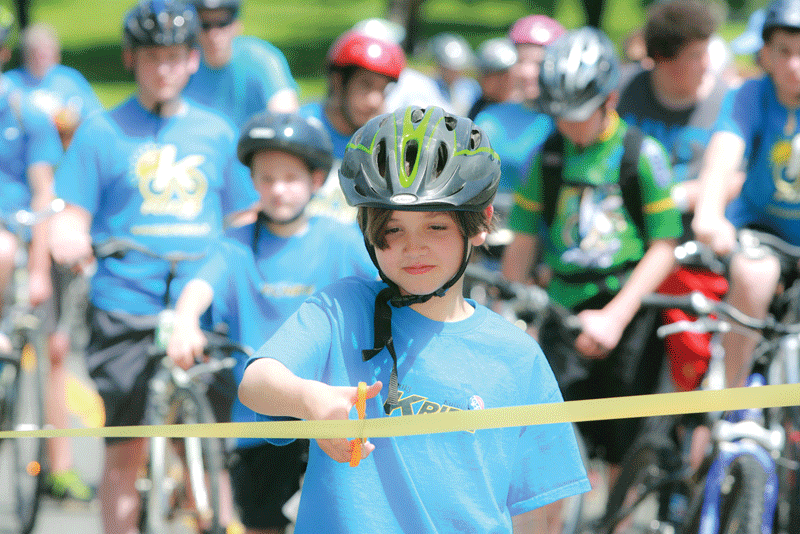 There’s also 10-year-old Luke Bradley, a fifth-grader from South Hadley who, last May, had the honor of serving as one of the event’s ambassadors, those who cut the ribbon to start the various rides — 5, 10, 25, 50, and 100 miles. That role had traditionally gone to individuals (usually parents) whose loved one had lost their fight with the disease. But for 2014, organizers wanted to extend the honor to a young person at a key turning point in their battle. So it was for Luke, who only a few weeks before the ride had undergone what would be his last treatment for acute lymphoblastic leukemia, essentially ending a three-year fight. He was still rather weak as he undertook the 5-mile ride himself, but he finished it. “It was fun, and I had a great time,” he said, adding that this was an experience he’ll never forget, and he intends to be back next year with his parents and younger siblings. And then there are Michelle and Domenic Battista, Katelynn’s parents. They both recall having mixed feelings when they were approached about creating a ride in honor of their daughter only a year after she died, but they eventually said ‘yes,’ and they’ve served as gracious hosts ever since, and say the event provides a powerful, meaningful, and at times emotionally exhausting way to honor Katelynn’s indomitable spirit. “It’s difficult in some ways because Katelynn’s not with us,” said Michelle. “It’s overwhelming to see all the people who come out, not only for our family, but their own families, where they have a situation where someone’s battling cancer. It’s great to see a lot of the survivors, especially the children, but it’s bittersweet because our daughter’s not there. Domenic Battista said Katelynn was a child who could light up any room just by walking into it. Michelle Battista says cancer couldn’t stop her daughter, Katelynn, from doing anything she wanted to do. Michelle remembers that Katelynn was committed to not letting her cancer get in the way of whatever she wanted to do, and, for the most part, she succeeded with that mission. And while doing all that, Katelynn decided she would also make time to appear on a radiothon staged by radio station WHYN to raise money for Dana Farber, where she received some of her care. It is here where the story of K-Ride begins, because it was roughly at that point where Katelynn began inspiring people to do things in her name in the ongoing fight against cancer. Two of the hosts for that radiothon were Dan Williams and his wife and long-time radio and TV partner Kim Zachery. Williams’ best friend, Steve Stark, worked for the Postal Service, as did Domenic Battista. “It turns out we all knew other, and so we all got very involved in Katelynn’s story,” said Zachery, adding that Katelynn became a regular on radiothons. 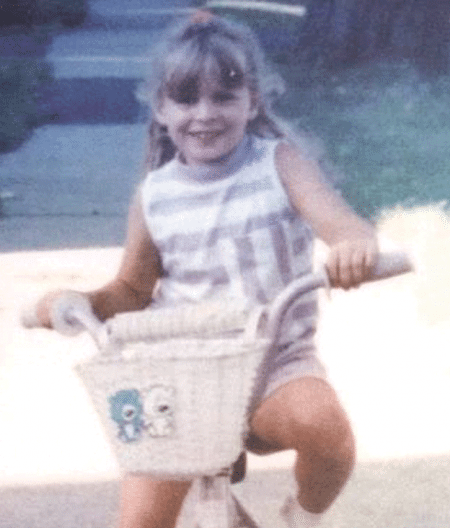 For Williams and Stark, that involvement eventually included a cross-country bike ride they undertook in 1996 — soon after Katelynn, who had been in remission, was again diagnosed with cancer — to raise money for Dana Farber and get the infusion room there named in her honor. And it wasn’t long after she passed away before Williams, Stark, and Zachery started conceiving an event that would enable Katelynn to go on being an inspiration — for hundreds of people, many of whom had never met her. The first K-Ride was staged in 2001 with roughly 60 riders. That number rose steadily to about 300, said Stark, and it has stayed around that level, dipping during the Great Recession, when most all fund-raising initiatives suffered, but rising again when it ended. Over the years, the event has expanded to include several different rides, and also a walk, with participants coming mostly from this region but some from well outside it. These are not races, but chances for individuals and teams to raise money through donations from friends and relatives in recognition of their participation. Riders 18 and over must raise $300 each, while riders under 18 and walkers 12 and over must raise $100. The format is similar in many ways to the popular PanMass Challenge, a bike ride that raises millions each year for the Jimmy Fund, but it is less demanding from a fund-raising perspective (PanMass Challenge participants must raise $4,000), and more of the dollars raised stay in this region. 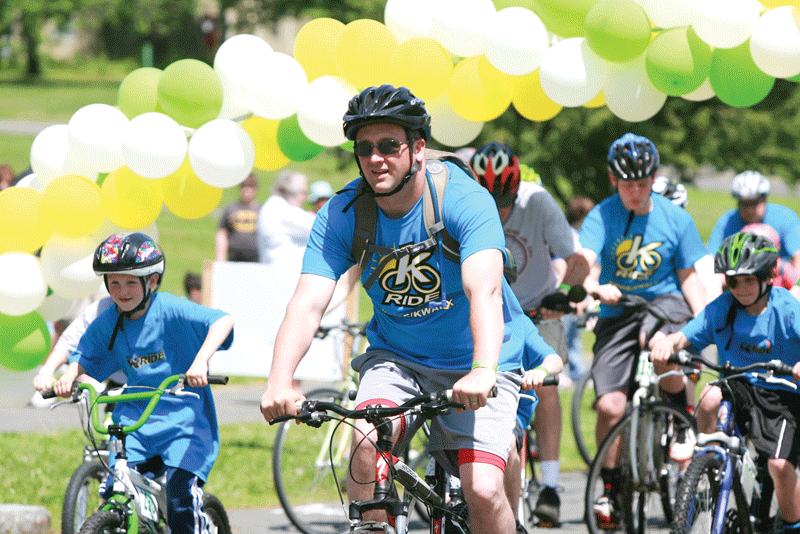 And while the K-Ride has grown in terms of participation, it has also gained a number of corporate and media sponsors who underwrite nearly all of the operating expenses, meaning that all the money raised by the riders goes to Baystate and Dana Farber. All those we spoke with said the K-Ride is much more than a sporting activity created to raise money for cancer programs. It’s an event, they note, and a family event at that, complete with a barbecue, a live band, and a host of activities. Williams joked that riders are “pampered,” with numerous water stops, fruit, sports bars, peanut-butter-and-jelly sandwiches, shower facilities, and even a massage station. But it is an event with a purpose, one that is reflected in everything from the names of the teams that participate (many, like Adam’s Animals, were inspired by people who have battled cancer) to the ambassadors who cut the ribbon, to the position at Baystate supported by the ride. And that purpose isn’t lost on anyone. Luke Bradley served as ambassador at the 2014 edition of Katelynn’s Ride only a few weeks after his last treatment for acute lymphoblastic leukemia. For Jeff Neumann, an artist from New York State, K-Ride offers him an enjoyable opportunity to fund more of the research and new treatment options that helped him beat back the non-Hodgkin’s lymphoma he was diagnosed with nearly 20 years ago. For Rossmeil, there are many connections between her son, Adam, and Katelynn and her family. Both families are from West Springfield, and Adam was diagnosed with the same form of leukemia (acute myeloid, or AML) as Katelynn. Adam is now in the sixth grade and recently marked the 10th anniversary of his bone-marrow transplant. He’s been a participant in the K-Ride since he was 3, riding first with his father, before graduating to his own bike and successfully completing first the 10-mile and then the 25-mile ride. The Rossmeil family rides and volunteers for the event to both celebrate what Adam has accomplished and create more stories like his. Williams told BusinessWest that the ride has generated many traditions over the years, none more poignant for him than the ambassadors. For the Battistas, meanwhile, the ride is a day that generates a wide range of emotions, from sadness to elation to pride in what has been accomplished. Katelynn’s ride participants describe it as a family event packed with fun, purpose, and poignancy. Such an individual was not available to families when Kateylnn was battling cancer, he said, adding that, when Grewal and others at Baystate indicated a desire to direct some of the K-Ride’s donations in that direction, organizers were in full support. Hired in 2012, the nurse practitioner has been an effective addition to the staff at Baystate, working with patients and their families in both inpatient (at Baystate Children’s Hospital) and outpatient (at the Sadowsky Center for Children) clinical settings. The NP assists families with everything from managing medications properly to scheduling tests to answering the myriad questions that are inevitably raised during a cancer battle, said Grewal, adding that, while the survival rates for childhood cancer are quite good, that doesn’t mean the process of treatment is in any way easy or without stress. And starting just after the news is broken to parents, the nurse practitioner serves as an intermediary of sorts and a needed source of information and support during an often-years-long ordeal that can and usually will test a family’s patience — and mettle. “There is a shock that comes to the family, and after the initial news on the first meeting, most of the things just fly over their heads,” Grewal explained. “We as physicians meet with the family on multiple occasions, but a nurse practitioner fills that role in between. And I wouldn’t say it’s hand-holding, although there is some of that. There are also many questions to be answered. While the K-ride is fun and rewarding, Zachery told BusinessWest, it is also a great deal of work. And that’s why organizers have at times — usually just after the event is staged — stopped to consider if this is something they want to continue doing. Those words apply to a cancer fight, obviously, but also to life in general — and perhaps a 100-mile bike ride as well. And they represent only one way in which Katelynn — and all of her many friends — continue to inspire and make a difference.